Are you a griller who is not in a place where you can have a full-blown grill at your home? Perhaps you want a quick easy way to cook your dinner items without heating up the whole house during the summer. Whatever the case may be, you want to investigate the new George Foreman Multi-Plate Evolve Grill. Gone are the days of just one set of plates that you have one option to use. The new grill offers a variety of ceramic grilling plates to give you an endless selection of cooking types. From the waffle iron grates to cooking muffins, this is a great option for every home that wants to grill indoors. If you’ve used a George Foreman grill in the past, you may have had a problem getting your food to stay on the grill surface. Some of the models were tilted so the grease would run down and this left you in a bind when you opened the grill top at times. This new option, however, offers an adjustable cooking angle. If you want to drain the grease from meat you’re cooking, simply tilt the grill surface. If you need to use the panini press or waffle iron aspect, then you can lay the grill flat to keep everything where it should be. Grilling on the George Foreman is simple with the removable plates. You can cook up your favorite pork chops or burgers, make breakfast and enjoy delicious waffles, or prepare cupcakes or muffins with the variety of plates available. The plates are also easy to clean up as they are dishwasher safe and offer stay cool handles for easy removal when you’re finished cooking. There are several different plate options you can choose. However, these do not all come with the grill so additional purchases will be necessary. Plates include options such as the cupcake tin, a griddle plate, mini-burger plate, and even a bake dish to cook casseroles in. 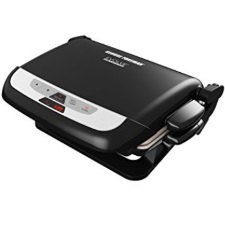 When you’re researching the George Foreman Multi-Plate Evolve Grill, you’ll find over 1398 reviews on Amazon and more on the George Foreman site and other locations around the internet. On Amazon, the reviews are varied but give the grill an overall 4.0 out of 5 stars. Most people have enjoyed their grill and love the versatility and freedom it gives them in the kitchen. Some of the critical reviews stated that they had problems with their ceramic plate not coming clean after several uses. Food seems to stick on to it instead of coming off as it should. Others stated their porcelain started to chip. There were over 700 positive reviews on this particular grill, just on Amazon alone. People who have been using the grill had this to say … “Very nice grill” … “Best George Foreman Grill So Far” … “The grill is super versatile” … “I use it to teach a children’s cooking class” … “Amazing upgrade” … “My waffles turned out great”. The conclusion for this grill is that most people who purchased it have absolutely loved the addition to their kitchen. It can make cooking meals multiple times a day very easy to handle. Whether you need it for a gluten free member of your home or just to keep the kitchen cooler during the summer, it can help you do all that and so much more. While the grill did have some complaints due to the paint chipping or ceramic plates sticking, customer service for George Foreman seems to handle those well. The company also offers a limited warranty for the product to help if any issues should arise. This new grill system seems to be a great addition to your home cooking supplies and an easy way to grill or cook up breakfast for the whole family. The plates are an additional purchase so you can choose what type of cooking you want to do with your new George Foreman Multi-Plate Evolve Grill.